Exact Landscapes are the experts in designing and constructing high end outdoor living spaces as well as large scale residential and commercial landscapes in Ottawa. 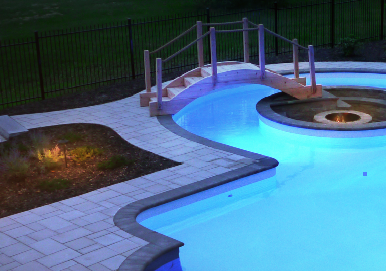 The Exact team is comprised of dedicated specialists providing a wide range of services including grading and excavation, retaining walls, interlock, pool surrounds,planting, outdoor living spaces (including fireplaces, water features entertainment systems, custom woodwork, and high end landscape lighting), and full scale outdoor kitchens. Read about the Exact Difference here. In our experience, the quality of the plan determines the quality of the outcome, and that’s why we pride ourselves on our thorough design process. Exact dedicates a lot of attention on the design process, because it is the most crucial stage in providing beautiful customized landscapes. During an in-home consultation, our award-winning landscape design team will assess all your needs, take exact measurements, then work with you to refine your vision through computer-generated colour designs, scaled drawings, as well as a detailed list of materials and plants. Our award winning landscape design team can also create a 3D rendering of your project from every angle, and from different times of day, to accurately portray shading and lighting conditions. This is reviewed in depth, and approved by you, our valued client, to produce a project plan that guides us every step of the way. This service is part of the Exact Difference, and ensures our expert team bring your vision to reality. The possibilities are endless, so book a consultation with us, and we’ll help shape your ideas into something beautiful. We understand every detail big and small when it comes to landscaping and outdoor living spaces. We take pride in what we create, and truly care about protecting your investment and our workmanship over the long term. Our property maintenance services allow you to relax and enjoy your property exactly the way it was designed. With Exact’s property maintenance services, your outdoor haven is in the right hands. We also offer a full range of commercial and residential snow and ice management services including lot clearing, sidewalk clearing, offsite snow removal, snow relocation & salt and grit applications. Having worked on many large projects for the City of Ottawa and numerous corporate clients, we are no stranger to large scale commercial and municipal landscaping. Services include Interlock installation, new sod installation, retaining wall installations, tree and shrub planting, and reinstatement of existing landscaping on large city reconstruction projects.